What's so Important about Learning Cursive? 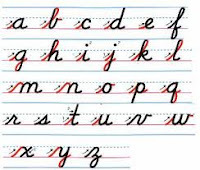 Many schools are doing away with cursive writing. Some believe it is not a necessary “21st century skill”. Classroom teachers feel they are too busy preparing students for standardized tests and don’t have time to teach such skills. 1) It is consistent. All lower case letters begin on the line, as opposed to printing when some begin at the top and others begin in the middle of the line. 2) It reduces confusion for students with directionality problems. For example, b and d look different in cursive. 3) When we write in cursive, words are connected and written in “chunks”. There is no question where one word begins and the other one ends. 5) Students will no longer be able to read historical documents such as the Constitution, The Declaration of Independence, let alone their great grandmother’s journal. 6) It helps students cultivate their fine motor skills since one needs dexterity to create fluid motions, and perfect the proper pressure to put the writing utensil on paper. Now I ask you: What’s so important about Cursive? Lots! Why Title a blog "Changing Minds?" Changing minds is a blog about education. It goes with what I do. I’m an Educational Therapist/Reading and Writing Specialist, that has a part in changing student's minds. 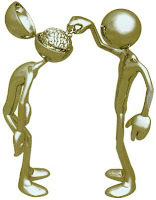 Research tells us that the brain is malleable; it is constantly changing - it is not fixed. We used to think that whatever we were born with, we were stuck with for the rest of our lives. What we now know is that as we learn new things – both physically (such as learning to play an instrument or a sport) or mentally (growing in understanding of a specific subject), our brain is changing and creating neural networks connecting new learning with past knowledge. Therefore, the name “changing minds” is intended to be understood on several levels: I hope to offer some personal thoughts, experiences and research that some will read, consider, and may result in a changed mind. I also hope to continue teaching children, providing educational therapy to struggling learners, and through modeling, questioning, encouraging and co-learning with my students, see their minds changed into independent, competent and confident learners. I have been teacher for over 35 years. I have worked in public, private and homeschool settings. I am a Certified Educational Therapist and Reading and Writing Specialist. I am a post graduate student working on Neurodevelopment in Education. I work one on one with students or in small group settings.